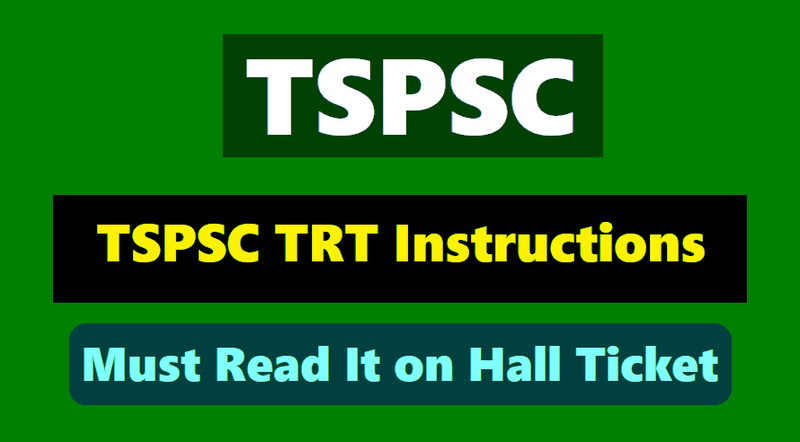 TSPSC TRT Candidates must read all instructions given on Hall ticket 2018, TSPSC TRT Instructions to Candidates, must read it on Hall ticket 2018. TSPSC TRT Exam Instructions, Procedure to Enter the Exam Labs - DO's, Don'ts while taking the exam,TSPSC TRT Recruitment Exam Instructions, TS TRT Recruitment Exam Instructions, TSPSC TRT Teachers Recruitment Test Instructions. The hall ticket must be presented for verification along with at least one original (no photocopy or scanned copy) valid identification card. Aadhaar Card may be carried by the candidate. This hall ticket is valid only if the candidate's photograph and signature images are legible. To ensure this, candidate is advised to get the print of the hall ticket on A4 sized paper using a laser printer, preferably a colour photo printer. The candidates who do not have clear photographs or no photo on the hall ticket will have to bring two passport size photographs along with a written representation to Chief Superintendent in order to be permitted to appear for the test. a. The candidates should use black or blue ball point pen only to bubble answers in OMR sheet. And should bring Hall Ticket without fail. b. The candidates should use black or blue ball point pen only to fill Test Booklet Series on side1 of OMR sheet. Use of Whitener/Blade or Eraser on OMR Sheet will lead to invalidation of OMR Answer Sheet. Recording Instruments strapped to their body or pockets. The gates of the Test Centres will be opened by 8.15 am and closed by 9.45 am & by 01:00 pm and closed by 02:15 pm. No candidate will be allowed to enter the examination centre after closing the gate. The checking procedure inside the test hall may include capturing bio-metric left thumbprint. Ink etc, on their hands/foot. Wrist watches to the Examination Centre. 11. The candidates should satisfy the Invigilator of his identity with reference to the signature and photographs available on the Nominal Rolls and Hall Ticket through valid Photo identification documents like Aadhaar, Pan Card, etc. 12. No candidate should leave the examination hall till the Examination time ends. 13. The Commission would be analyzing the responses of a candidate with other appeared candidates to detect patterns of similarity. If it is suspected that the responses have been shared and the scores obtained are not genuine/ valid, the Commission reserves the right to cancel his/ her candidature and to invalidate the Answer Sheet. 14. The candidates must note that his/her admission to the examination is strictly provisional. The mere fact that an Admission to the examination does not imply that his/her candidature has been finally cleared by the Commission or that the entries made by the candidate in his/her application have been accepted by the Commission as true and correct. 15. The candidates are expected to behave in an orderly and disciplined manner while writing the examination. If any candidate takes away Answer Sheet of OMR based examination, his/her candidature will be rejected and in case of impersonation/ disorder/ misbehavior during Examination, necessary F.I.R. for this incident will be lodged with concerned Police Station, apart from disqualifying his / her candidature. 16. Candidates trying to use unfair means shall be disqualified from the selection. No correspondence whatsoever will be entertained from the candidates. 17. The Penal Provisions of Act 25/97 published in the A.P. Gazette No. 35, Part-IV.B Extraordinary, dated: 21/08/1997 and Rules of Procedures of TSPSC published in vide Gazette No.60, Dt: 28/12/2015 shall be invoked if malpractice and unfair means are noticed at any stage of the Examination, apart from debarring from future exams of TSPSC, Other State Public Service Commission's & UPSC. (i) Wherever Written Examination is held, only those candidates who are blind are allowed to write the examination with the help of scribe and 10 minutes extra time is permitted to them per hour. (ii) An extra of 20 minutes per hour is permitted for the candidates with locomotor disability and CEREBAL PALSY where dominate (writing) extremity is affected for the extent of slowing the performance of function (minimum of 40% impairment). Scribe is allowed to such candidates also. (iii) Scribe will be provided by the Chief Superintendent concerned to those candidates who don't have both the upper limbs for Orthopedically Handicapped. However, no extra time will be granted to them. (a)The scribe should be from an academic discipline other than that of the candidate and the academic qualification of the scribe should be one grade lower than the stipulated eligibility criteria. (b) The Candidate as well as the scribe will have to give a suitable undertaking confirming the rules applicable. 18. The candidates are instructed to fill the following column in the nominal rolls in additional to the regular information. Imp: Those candidates who have entered the ineligible / non-relevant qualifications in the column of ''others'' in their application are required to produce requisite qualification as mentioned in the notification and other G.O.s & memos issued by the Government from time to time, at the time of verification if they are picked up for certificate verification. 19;The mere fact of their admission to the examination does not imply that their qualification is accepted. Their candidature is liable for rejection if the qualification and conditions specified in the notification and other G.O.s & memos issued by Government from time to time are not fulfilled. Question Booklet Series Code: 1 letter (The series are A/B/C/D).